Also called “transtibial amputations”, this is the most common amputation of the lower extremities. This is a catastrophic injury. In fact, there are two below the knee amputations for every one above the knee (transfemoral) amputations. There is a special desire for below the knee amputations because, when the knee is a part of the residual stump, a great deal less energy is required for walking and there is a greater chance that the individual will accept and use a prosthetic device. After transtibial amputation, the person stands a good chance of being able to have a normal life and a near-normal gait. About three-fourths of amputees accept and use a prosthetic device after a transtibial amputation, whereas only 26 percent of patients use a prosthesis when they have a transfemoral amputation. Among those patients who had a transtibial amputation because of a traumatic injury, 84 percent were able to make use of a proper prosthesis and wore it at least 13 hours per day. These people described themselves as being only minimally or not at all disabled, despite wearing a prosthetic device on a daily basis. The mortality rate is much less with transtibial amputations when compared to transfemoral amputations. In one study, the perioperative mortality rate among below the knee amputations was about 9 percent when compared to above the knee amputations, which had a perioperative mortality rate of up to 29 percent. It was once felt that people healed better if the amputation was above the knee; however, with advances in surgical and wound care, this was found not to be the case and the added advantages of transtibial amputations made them much more popular in recent years. One research study showed that, when a transtibial amputation was attempted, up to 96 percent eventually healed, although some needed a second procedure to clear up a wound failure. If you add all that to the likelihood that a single transtibial amputation puts one at risk of losing the other leg as well at a rate of 10 percent per year, it means that, when the opposite leg was removed in a below the knee amputation as well, there was an increased chance that the patient would still be able to walk as a double amputee. Causes of a Below the Knee AmputationOne of the main causes of a below the knee amputation is a peripheral vascular disease with or without diabetes. This is becoming more so because of our aging population so that more people need a medical amputation than people who sustain a trauma that results in an amputation. Smoking is a risk factor for a leg amputation. In diabetics, the limb may be lost because of infection of the foot in combination with poor circulation to the foot and lower leg. Diabetics often continue to walk on open sores of the leg because they don’t feel the injury and don’t know it is there or that it is serious. Another cause of an amputation of the leg below the knee is leprosy, also called Hansen’s disease. These people get an infection of nerves in the peripheral tissue, losing bone and tissue to infection. Sometimes an amputation is required to definitively get rid of the infection. In cases of trauma, a below the knee amputation should be attempted even if there is some damage to the lower leg because it is possible that initially, injured tissue will heal itself so that a higher amputation may not be necessary. If, however, there is a severe vascular disease so that it is unlikely that a below the knee amputation will heal, it is probable that a transfemoral amputation will be necessary instead. Children who need to have their foot cut off for some reason should have an ankle disarticulation if at all possible so that the tibia and fibula will grow properly, yielding a leg that will be long enough to accept a proper prosthesis as the person grows to adulthood. Treatment of a Below the Knee AmputationBefore getting an amputation, attempts at controlling both local and systemic infection should be undertaken. Tests should be undertaken to make sure the patient is healthy for surgery and doesn’t have a concomitant urinary tract infection or a lung infection. The patient must have adequate nutritional support for healing and must have a reasonably functioning immune system. They need to have supplementation with things like multivitamins, vitamin C, zinc, and iron. These things will all promote healing. The doctor must decide at what level the amputation must be. It all depends on what areas are damaged and on the blood flow to the remaining stump will likely be. Tests can be done to see what is happening with the circulation at the various areas of the leg, including an angiogram, which is a test to see what major vessels to the leg are blocked and, if so, how much blockage there is. Patients should be encouraged not to smoke as wound healing is much worse if the patient continues to smoke after having their amputation. The amputation itself can be done with a local anesthesia, spinal anesthesia or general anesthesia, depending on how healthy the patient is at the time of surgery. Extremely ill patients will have their amputation done under local anesthesia because they do not tolerate higher forms of anesthetic relief. Even so, an amputation can be done using local anesthesia if necessary. The amputation is done much the same way as in other amputations. The soft tissue is cut in such a way that a myocutaneous flap can overlie the ends of the bone, which are smoothed off and rounded for comfort. There should be enough salvageable muscle so that the end of the bone is sufficiently padded. Prosthetics for Below the Knee AmputationsThe type of prosthetic device to use depends on the overall health of the patient, their intended activity level, whether or not they live in a hot, humid environment and the time since they have had an amputation. There are special prosthetics used for different sports and patients may have their own personal goals which determine the type of prostheses they get. Care must be taken so that the patient doesn’t have skin problems because of their amputation and prosthetic fitting. 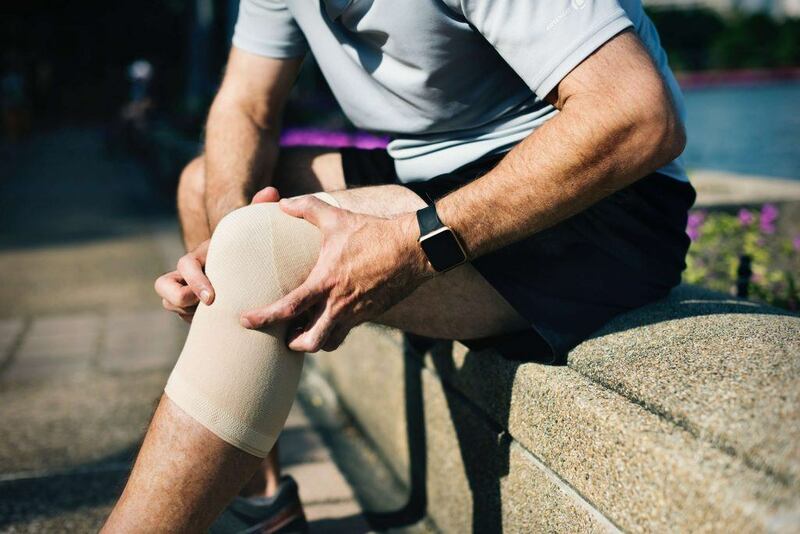 Ideally, the knee shouldn’t be arthritic because this can impact their ability to go through the physical therapy necessary to be able to use the prosthesis effectively. Ideally, the knee must be able to flex by 70 degrees in order to go through a normal walking swing without difficulty. The thigh muscles must be strong enough so as to get a normal gait. The patient should be given a prosthesis as soon as the wound from the amputation heals. There are many types of amputation prostheses, some of which are rigid and attach via straps and belts. Others rely on a socket liner that uses suction to attach the prosthesis to the stump. Often, patients prefer to have a soft inner liner that is encased in a harder plastic frame in order to have the most comfortable fit. The type of foot used in the prosthesis depends on the weight of the patient and on how much ambulation they will be doing after they have gotten used to the process. There are prosthetics used for specific sports and prosthetics used for cosmesis so the patient can feel more comfortable under social circumstances. Generally, a prosthetic device for the lower leg is easy to get used to and most patients will use their prosthesis for the long haul.